One day before my due date, our baby was born!!! It's a BOY! Little Lucas is just wonderful, sweet, cuddly, fun, and adorable! We are so in love, and so blessed. I had to have a C-section because his heart rate was dropping with each contraction. I had been in labor for 27 hours, so I didn't care at all that I had to have a c-section. Maybe because I was active and working out (at least power walking for about 3 miles most days, some light weight lifting) all through my pregnancy, but the c-section recovery was much easier than I anticipated. I didn't even need to use all of my pain meds which was a total surprise. Anyway, I hope that if you have to have a c-section, it isn't terrible. In the Pupps realm, I followed the 70% or so who have Pupps and then go on to have a boy! The bad news is that I had some terrible postpartum itching. It wasn't as bad as Pupps because it wasn't over my whole body, but it was like a jumping rash! For a week or two, I was insanely itchy on the back of one of my legs. Then the rash moved to my lower back, later to my chest, and then to my stomach a bit. This rash jumping happened for about two months. Now I am 4 months postpartum and I still have a very itchy scalp. It doesn't itch all day long, but at least some part of each day. I read about it online, and there is definitely a solid-sized online community who also deals with itchy scalp after baby. Damn hormones! I have been using Head and Shoulders Instant Relief Scalp Soother, which I originally bought for my Pupps problem. It is a godsend. It smells so good and immediately cools the itch. For my itch, I tried my old stand by coconut oil, but it really wasn't working for my postpartum problem. At that point, I was SO SO sick of the smell that I was over it anyway. I had used coconut oil every day of my pregnancy from 20 weeks on to deal with the Pupps itching. I never got stretch marks, so that was an added bonus! When I needed a new solution, I went to my doctor and got prescribed Triamcinoloe Acetonide Cream, 0.1%. That works well for me when the itch pops back up again. I am still nursing my son, which my doctor obviously knows, so I am assuming it is safe enough for that. Since it's a topical thing, not a pill, I think that's the difference. Anyway, good luck in your fight against Pupps. It is just the worst, and I couldn't believe how little is known about it. I hope this little blog will give you a few ideas of what to try, and what might work. I'm thankful for this little guy!! As they always say, all this lousiness in pregnancy is worth it in the end. You get a wonderful little baby to love!!! I appreciated her insight and wanted to add some of my own, so here you go. Of course, this is just my personal experience. I am a teacher, not a doctor, so of course talk to your doctor!! Some Pupps blogs include pictures of their terrible rashes and then improvement. I only took a few pics, mostly to show my family and for laughs! Okay, on to the remedy ideas. One blogger said she "threw the kitchen sink" at Pupps, trying a ton of different things all at once, since neither she nor I could be complacent slowly trying all of these ideas "scientifically." Since the itching is so miserable, if one thing didn't work, I quickly moved on to the next. 1. Drink tons of water with fresh lemon or lemon juice squeezed in. General pleasantness or unpleasantness of treatment: 9 out of 10- Pleasant. When at home, I drank a ton of water with fresh lemon squeezed in. At school, I brought a mini lemon juice bottle with me and drank, drank, drank all day. The idea here is to flush your liver. This didn't work at all to help my Pupps, but of course drinking water is great for you. I have also read about the benefits of drinking lemon water, so I figured I was helping myself in some way. I had to go to the bathroom all of the time, of course, so that was the lone drawback. Also good to note (thanks to my husband for this FYI) rinse with plain water after finishing your cup of lemon water since it's not great for your teeth. General pleasantness or unpleasantness of treatment: 6 out of 10- a bit painful, but also calming. One of the Pupps blogs suggested acupuncture so I bought a Groupon and tried it twice in a week. I really liked the place I went. It was very calming and the acupuncturist was a good listener. It was my first time trying this, and I was a bit nervous going for the first time. I was also excited because I was completely miserable and if there was any hope of getting better, maybe this was it. She put pins in certain spots, and the only ones that hurt were the ones in my ears. I had very hot and red ears when I got there, and she explained that the hot ears meant that there was too much heat inside. She poked my ears a bit to "bleed them" and after, the heat was a bit less. On the second visit, I asked her to try using the technique of cupping which I read about on a Pupps blog. That didn't really work either. Both times I went to acupuncture were pretty calming. You just lie there for 30 minutes after the poking to let the needles work their magic. I do like acupuncture, and will go back if I need it for something else in the future. Sarna is a brand of lotion I hadn't heard of, but I purchased it at Rite Aid. I bought it and used half of the bottle in 2 days when Pupps was at its worst. It gives immediate cooling, calming, soothing goodness on your worst Pupps itch. There is menthol as a main ingredient so it makes you COLD which is nice when Pupps makes you feel so hot. It is another option if you don't like calamine lotion. I wish I had used this instead of calamine at first because it is way less messy. I didn't love it because it didn't stop the itch for very long at all. Calamine lotion is familiar to those of us who had chicken pox back in grade school. It is a very runny pink liquid and made me happy when it stopped my itch for a short time. It irritated me that it's messy. I was pleasantly happy that it sunk into my skin so it didn't look super pink. Go with Sarna instead. I got this from our local "crunchy" store. It tastes pretty good. It's supposed to help clear out your liver too, I think. I didn't get any relief from it, but it was pleasant tasting at least. Also available at earthy stores. Pleasant tasting as well, but again, didn't feel any better after drinking it. I took two of these pills 2 times a day for a week. It didn't help. I didn't mind taking the pills as I didn't even taste them, but I was disappointed they didn't work. This is the WINNER and CHAMPION!!!!!!!!!! My husband bought this at Walmart. I was desperate and thrilled that this has helped me get 95% better. The Pupps rash is now gone, and I am reapplying coconut oil 4 times a day to keep the itch away. My only complaint now is VERY dry skin. This is nothing compared to what I was dealing with before. I have used a whole tub of this in 5 days. It smells really good and amazingly doesn't even show when you get it on clothes or your bedsheets. Love love love this!!! Try it!! Hope it works for you too! My head itched like crazy in the middle of my Pupps battle. Yeesh. Not a pleasant part of Pupps. I bought two kinds of anti itch for the scalp, and this one smelled like medicine. Ew. It felt decently good, but like it belonged in a hospital. I also tried Head and Shoulders brand and that smelled like a hairspray or hair gel. Get the Head and Shoulders version instead! It smells like a nice haircare product, it's not greasy or gel-like, and works like a charm to stop the itch. Total winner! OWWWW. Showering in general when I had Pupps was miserable for me. It felt like the water was cutting me. The Grandpa's Pine Tar soap smells like a campfire. I don't think I smelled like one after showering since I had lotions on too! The soap was painful to rub over the rash. That being said, many other Pupps sufferers recommend this, and my bestest sissy ever was so sweet and sent it to me (she found it on Amazon). I was so grateful to try what worked for so many... sadly not me though! I only tried this twice, and my rash didn't get any better. I placed the peels (fruit remnant side on the rash) on my skin and pressed it down. I could feel something tingling, which I think meant it was working, but I never had enough time to just lie there for awhile to see if it actually took away the rash. I did it for 20 minutes twice, and if I hadn't discovered coconut oil, I would've tried this remedy again. Husband lining up all of the things I was using in my fight against Pupps! 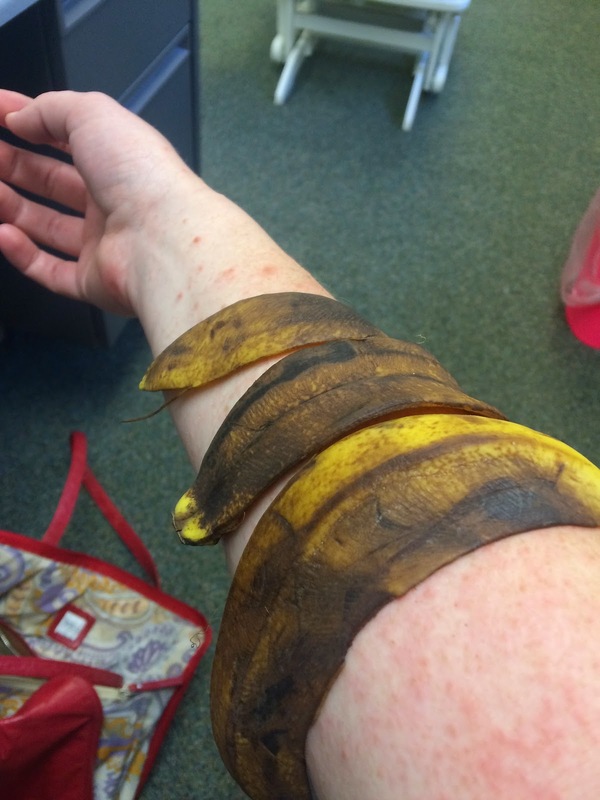 Banana peel attempts... didn't work for me, but definitely gave my co-workers a laugh! This does not smell good. It gave me minimal relief. It dried me out, and I used Sarna on top of it. I didn't mind taking these teeny tiny pills but they didn't do anything for me. I found them in a earthy store. I bought two boxes of this when I was first diagnosed, but I discovered that even Pupps doesn't turn a person who doesn't like baths into one that does. I never used any of my oatmeal bath packets, in part because I didn't like the idea of taking a lukewarm bath (which is recommended with Pupps). So don't buy these if you don't like baths! I got this product the same day that I discovered the glory of coconut oil, so I didn't give this much of a chance. Maybe it'll work for you. It smells good enough, but I applied this to one arm and coconut oil at the same time on the other arm and the oil worked way better for me. This is a great way to combat Pupps. I used these through the night and it helped to stop the itch. I moved it from spot to spot as different areas flared up. The cold kind of kept me up, which is the only reason I didn't give it a 10. I like Bio Oil. I have been using it for awhile during this pregnancy to avoid stretch marks. I didn't use this for long when I first got Pupps on my belly because it didn't make things any better. It smells nice though, and I think it works for avoiding stretch marks, just not Pupps. This works for a short time. It's nice to keep by your bedside for the night since it's easy to spray on the itchy spots. It smells a bit more medicinal than I would like. This smells like diaper cream and is really thick and gooey. I mixed it with cocoa butter and it worked pretty well. If my Pupps comes back, I will do this mix again. My husband had a wicking shirt and shorts from our hiking day at Machu Picchu a few years back. He read somewhere that this might help with Pupps. I wore the "outfit" to bed two nights in a row and it was comfy but ultimately not super helpful. I was 100% miserable at this point in my Pupps journey, so clothes weren't going to make a huge difference anyway. This didn't do anything for me. It is in the same realm of lemon water-- trying to clear out the liver. I had never tried it before. I thought I would hate it, but it wasn't awful. Same thing as V-8... trying to clear out liver. It is a fairly yummy juice (I even got the healthy version, no added sugar) but didn't do anything for my Pupps. Zyrtec can safely be taken during pregnancy for allergies. Pupps is an allergy I guess, but I never really felt any relief from this. It's just one pill every 24 hours, so it's not unpleasant to take, it just never worked for me. This is also safe to take during pregnancy. I had high hopes for being knocked out by it but the itching was so bad that it kept me wide awake. For the first few terrible days of Pupps, it worked for 3-4 hours but then I was wide awake and miserable. Later, it didn't work at all. I got this prescription from my doctor after I explained that Benadryl wasn't working at all and I wasn't sleeping. I take two a night to sleep and not itch. It is an anti itch pill. I am allowed to take it every 8 hours, but it does cause drowsiness so I only take it at night. I haven't done a ton of reading about it as it relates to pregnancy, and may try to stop taking it tonight since I am no longer miserable. I have taken it for 6 nights and I have gotten progressively better, so maybe this has helped me beat Pupps too! This was given to me and really didn't help at all, but it sure smells nice! Whew! 29 different things! I hadn't found much at all online about people who had beaten Pupps, especially women who got it earlier in their pregnancy. I hope this will help you!!! I got Pupps FULLY at 21/22 weeks of pregnancy and now just two weeks later, I am sitting here blogging about it instead of trying to scratch my skin off. I still do itch, but I am mostly just dealing with super dry skin in the places that were the worst with the Pupps rash. I am slathering on coconut oil often to moisturize and stop the itch when it comes back. It seems like people have all different experiences when it comes to beating Pupps. I hope you can write your own success story soon!!! Stay strong, and keep trying until you find something that works!!! Well, I read MANY blogs, chat boards, etc. in my frantic search for the magical way to cure this damn disease, and I really appreciated all of their insight and opinions. Since traditional medicine wasn't working for me, I had no choice but to turn to the wonderful web for ideas. As you probably know, Pupps is not a very well-researched disease because the eventual outcomes for mother and baby are just fine. So Internet research was much more important than ever before for me! My dear husband also did a STELLAR job researching ways to combat Pupps. He is a researcher by training, and found even better resources than I did that were full of ideas to try. He is the best, and I am grateful for him every day!!! Two friends of mine did deal with Pupps, though much later in pregnancy, and I did take this as a comfort, since no one else seemed to have any idea about it. I read over and over the information I could find online, hoping to find the magical answer. Pupps effects around 1 in 150 or 200 women during their first pregnancy (again, different sources say different things). 70% of women who have Pupps go on to have boys. (Anecdotal evidence that I read from women voting on if they went on to have a boy or girl said that 60% had boys.) 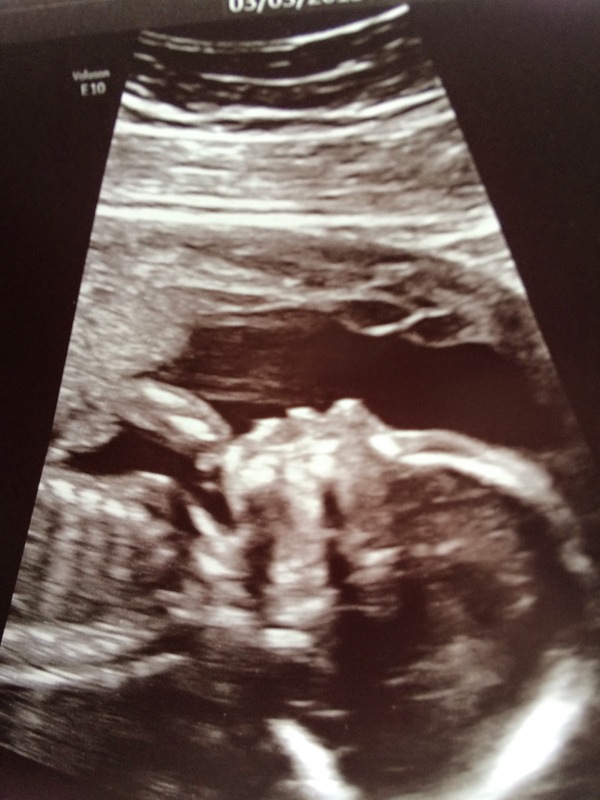 We are not finding out until our baby is born if it's a boy or girl, but I am guessing boy much more now! Pupps usually comes in the third trimester. Most women that I read about had it for their last two weeks of pregnancy. The itching was so terrible that many of those women chose to get induced early rather than deal with it. I was so jealous of those women who were at the end of their pregnancy!! Pupps usually appears first on the belly, often within stretch marks. Neither of those things happened to me. Your face is your saving grace. Pupps does not go after your face. Thank God for that! Some research says that Pupps has to do with your liver. Many of the remedies attempt to flush it out, like V-8, lemon juice in water, nettle tea, dandelion tea or capsules). Most people didn't seem to get it until I showed them my arms which were raging angry Pupps spots! Itching while pregnant doesn't sound that bad, but this Pupps business is something else entirely! I feel your pain! I gained a ton of knowledge about the options to fight Pupps, and reviewed them in the next post on this blog. I am 32 years old, pregnant with my first baby, and was on top of the world! I didn't have any morning sickness, had great reports from the doctor, exciting and positive ultrasounds, and was on cloud nine! We went to Mexico for a baby moon at 17 weeks pregnant and I was already starting to be itchy. I dismissed it as skin starting to stretch and tried to ignore it. We went in for our 20 week ultrasound and saw our super cute baby! The next week, I went in for my 20 week appointment with my doctor, and as she was doing the fundal length measurement (to see how big the uterus is), I pointed out a few spots that I had random red bumps and itchiness This was the beginning of the dreaded Pupps, though I was not immediately diagnosed. I didn't have many of the key tell-tale signs of Pupps that clinicians are used to seeing. I didn't (and still don't!) have stretch marks with the rash in there. I was only 20 weeks pregnant and Pupps usually isn't seen until the third trimester. I didn't have any rash break outs on my belly until 21 weeks or so, and that was what my doc was looking for since it usually starts there. I did get a steroid cream (triamcinolone 0.025%) prescription that day. I filled it and started rubbing it on the spots I was itching. I used it for a few days, starting to put it on more and more as I got more miserable. It literally did nothing. I later read the fine print and learned that there could be "teratogenic effects" which I Googled and learned means "birth defects." Ahhhh! I immediately threw it away, and got another appointment with my doctor. I felt like I was losing my mind due to the insane itching and my inability to sleep through the night. By this time, I was taking 2 Benadryls to try to sleep at night, but it was not doing ANYTHING. I would get maybe 3 hours of sleep and then basically be awake, itching, trying not to itch, repeat, repeat until I was actually happy when 6am rolled around and it was time to get up! Awful. I was wearing long sleeves, pants, and light scarves each day to work because the rash was almost everywhere on my body. It was on the back of my hands, all along my arms, neck, chest, stomach, parts of my legs (upper thighs and ankles especially), and even my scalp was insanely itchy. I was THRILLED to get an appointment and actually get a diagnosis for Pupps. She looked at me for one minute and told me, yep, you've got it. It was such a relief to actually get a diagnosis, since you already feel like you are going crazy when you get this disease, it's nice to have a real live medical professional tell you that yes, you do have that thing you basically already knew you did. The bad news was that I got diagnosed at 22 weeks and everything I read online was that once you had it, it was basically with you until you delivered the baby. The doctor told me to keep taking the Benadryl at night, and take one Zyrtec (which is a 24 hour pill) each day for the itching. I also was told to get calamine lotion and oatmeal baths. Next, see my review of each of the MORE than 25 products I tried in my fight against Pupps! Now for the good news.... I am now 24 weeks pregnant and 95% healed from a TERRIBLE case of Pupps. I wanted to share my story since so many others helped me find the right products to finally beat this disease!